1. Slow blogging last week. I somehow managed to get myself tangled up in a number of things these first few weeks of June. First of all, last week I ran a little program called Introduction to Catholic Home Education (in Ohio) for our homeschool group. I had some great gals who volunteered to share some of their experience and wisdom and Calvin even managed to come by and give his experience as a homeschool alumni. We were able to advertise on the local Catholic radio station and get on their community calendar for two weeks. We also put out some $$$ and took out an add in our diocesan paper. Despite all of that we only drew 8 people - BUT those were 8 people that we had picked up from other out reaches - like weekly play groups in the park and some parties for younger children like the ones for Valentines day and Epiphany. So it was good that those opportunities brought in some interested people. Here's the third clip from that event. 3. Last week was also Rosie's 7th birthday. She is 7. 7 years old. I can't believe it. 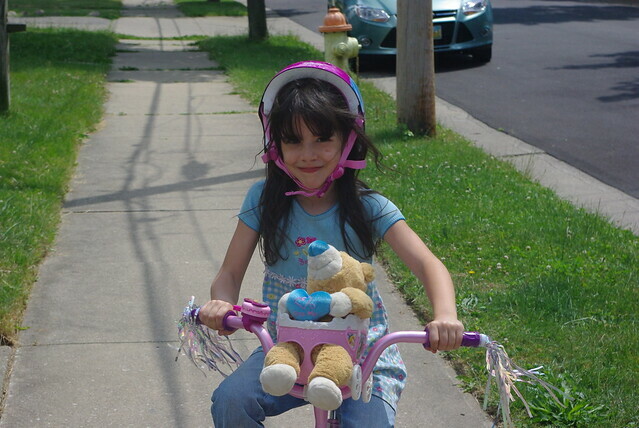 What she wanted more than anything else was to get a bike this year and so we got one. It is dripping in girlie colors with flashy streamers and Disney princesses. She absolutely started riding it right away. I can only imagine what she will be like in 8 years when it's time to get her driving temps! 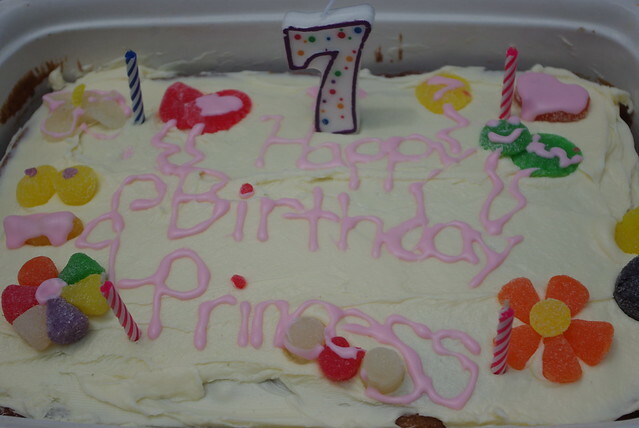 Izzy and her friend made the cake. 4. 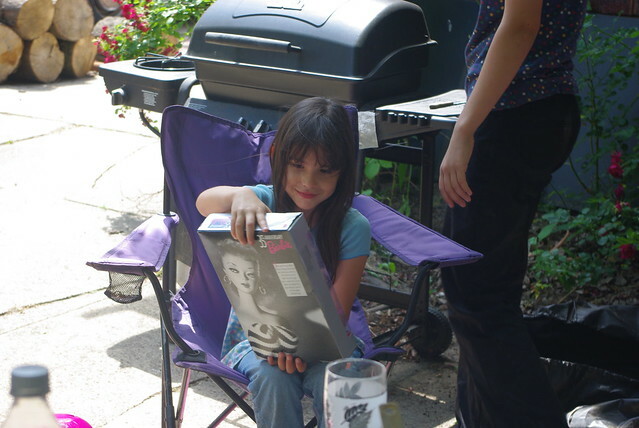 I also got her a Barbie. I found it at a tag sale last fall for like $3 in the home of this lady who had TONS of Barbie stuff. I hid it in Gabe's dresser all these months, just waiting to have it for her birthday. She seemed to like it! 5. Today I have to help with a wedding. Which is fine. Nice couple and no big dramas. But right afterwards I have to get to writing a speech for Wednesday night when my homeschool presents...Homeschooling High school! That event was one we got a request for. It seems that some moms near the northern part of our county are facing the high school years and they really wanted so insight and to hear the experience of others. So I have another great group of gals for that event as well as a graduate from CollegePlus! who is also employed! I think it will be a great evening chock full of information and wisdom. My part is merely kind of an introduction and then to introduce the speakers. 6. In preparing for the talk it was interesting to read about "accreditation" and what that means to high schools. A lot of homeschoolers spend a lot of money so that they can get an "accredited" high school diploma, but what I learned was that as long as they have an understandable transcript and the ACT or SAT scores, they really do not need to have an "accredited" diploma to get into college. Lee Binz, the Homescholar talks a great length about that. But what was even more interesting to me was that it is very difficult to find if a regular brick and mortar high school is "accredited." I looked all over my school district's site and I couldn't find whether or not it was accredited. I couldn't find a list of accredited high schools in Ohio either. And if accredited, accredited by whom? It seems to me that "accreditation" only matters at the college level if you want to be able to move your credits around. Other than that, it doesn't seem that important. 7. On that note, I'm reminded that a few months ago I wrote about lost adult children. I know that homeschooled children can lose their way and fall into sin. Catholic schooled graduates do as well. I now know of at least three girls who graduated from prestigious Catholic high schools in our area (which I cannot seem to find accreditation on either) and are now unwed expectant mothers. So what's the difference? about $8000 a year in tuition money apparently. I'm not an expert on school accreditation, but my general understanding is that all public hs are accredited by the state basically because the state has certain requirements they have to meet as far as certified staff and course offerings. Some schools go further and seek out regional accreditation from an organization like the Southern Association of Schools and Colleges. They have standards the school has to meet as far as student/teacher ratio, classes offered, facilities etc. They accredit both public and private schools. If I decide to open R's private school then becoming accredited tells colleges and people that I've met at least minimal requirements. Colleges may accept my students only on a probationary basis if I'm not, because I haven't given them any guarantee that the kids have actually studied anything for any length of time. I personally have not heard of any student being accepted probationally. I do know of many students who get accepted and have to take a lot of remedial classes. Perhaps that's the same thing? and many of those students were local PS graduates.